The shirts are constructed using a combination of flat rings with round rivets and solid punched flat rings, European 4-1 weave and with an internal diameter of 9mm. Although slightly heavier than wedge riveted maille, construction of these is much faster with the use of the pin rivets, hence the difference in cost. The round pin rivets are generally thought to be an early period style, pre C11th/C12th, although there was perhaps regional variations to this. Like all of our maille, in terms of total weight it is comparable to original items, although lightweight compared to other products on the market. It is also very strong. Overall, it is perfect for staying ahead on the battlefield when those around you are in need of a lie down. 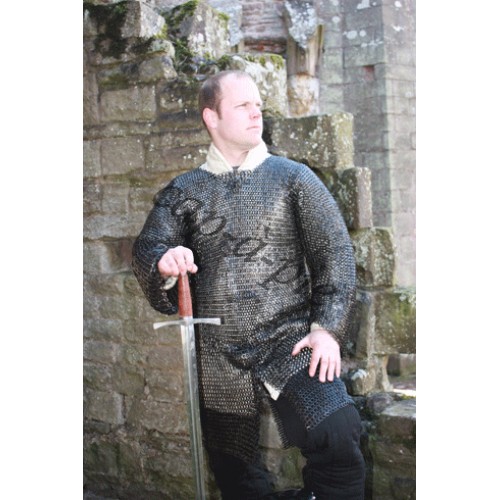 Our Authentic Style Blackened look, with wear over time, dulls down to a grey finish which is comparable to some examples of original maille. 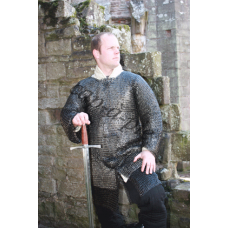 All our maille shirts have a brass armourers ring attached in the front, similar to original examples. This unique yet small addition can be a great talking point for members of the public. Note: all sizes at full stretch armpit to armpit and external measurement. - If you are unsure of what size, hold tape measure in a loop of either 48"(121cm), 54"(137cm) 60"(152cm) or 66"(167cm). Then with your normal padding on, see which "loop" you can easily slip over your arms and shoulders. Do you have any questions about Round Riveted Hauberk 48"? These shirts are constructed using a combination of flat rings with wedge rivets and solid pu.. These shirts are constructed using a combination of flat rings with wedge rivets and solid punc.. The shirts are constructed using a combination of flat rings with round rivets and solid punched f.. Custom Order Pavle Pelikan Wedge Riveted Hauberk 54"